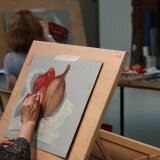 Community based art classes suitable for beginners or those that have not picked up a pencil since school days and would like a refresher. Based in Shotley Bridge,Consett with additional classes across Northumberland. Fiona ia a professionally qualified teacher, with over 14 years experience of teaching in both Further Education and within local communities. Classes cover everything from basic observational skills to more experimental techniques, in a relaxed and supportive environment. Please contact Fiona directly to check availability and up to date prices for classes or to arrange a workshop session with your own Art group.